Welcome to Emmy Cooks! You can see some of my favorite recent recipes by clicking the “My Favorite Recipes” category on the sidebar (here are June, July, and August). If you like what you see here, you can sign up on the sidebar to receive a daily recipe by email, add the RSS feed to your own reader, or follow Emmy Cooks on Facebook, Twitter, or Pinterest. I’m starting to feel rushed now that summer’s days are numbered. I never told you about my favorite summer cocktails! We haven’t even talked yet about whether to drench tomatoes in brown butter! We’ve hardly grilled together at all, except for a lonely piece of fish and those eggplants. Tune in next summer, friends, because some of those may have to wait. But this broccoli can’t wait. Besides, broccoli is a vegetable that will come along right into fall with us. And once you taste this grilled broccoli, you’ll be firing up the grill every chance you get, even after summer’s gone. The magic here is both taste and texture. The smoky depth of flavor and the high notes of freshly-squeezed lemon. The tender stems and and the crisp, nearly-charred florets. The anchovy vinaigrette below is a gorgeous finishing touch, but olive oil, salt, and lemon alone are plenty to make this dish the surprise star of any meal, at any time of year. Grilled Broccoli: First off, buy more broccoli than you think you’ll want because it will be so darn tasty (and it shrinks a bit on the grill). If your broccoli is in large, tight heads, quarter the heads (leaving the florets attached to the stems) and peel the stems. If your broccoli is looser and leggier, simply divide it into long florets and peel any woody parts of the stem. Now you have to decide whether to steam the broccoli before grilling it. If my broccoli pieces are large, I steam them to ensure that they’ll cook through on the grill, but if they’re smaller pieces, I don’t steam them. If you choose to steam your broccoli first, give it about five minutes in the pot, just until it turns bright green. Toss the broccoli, steamed or not, with olive oil, salt, and pepper. 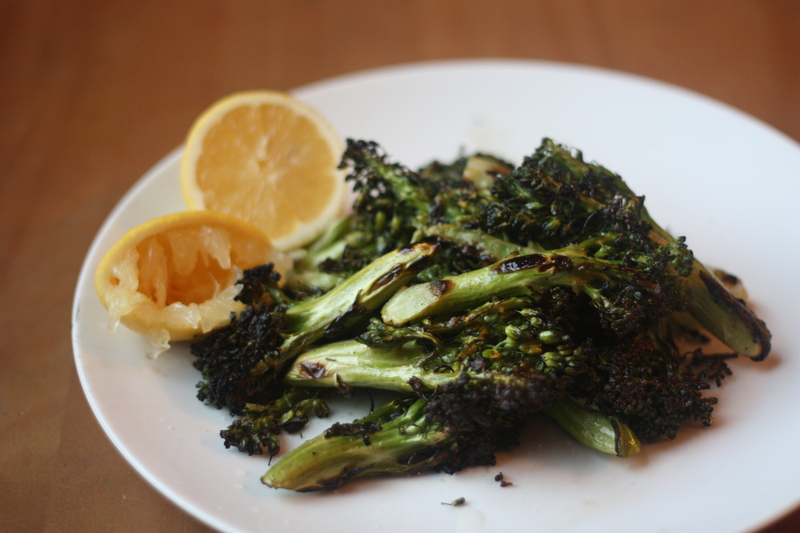 Grill broccoli over high heat, turning occasionally, until the florets are crisp and the stems are browned in spots. Remove to a serving plate and dress with either (a) a lemony anchovy dressing* or (b) olive oil, a generous amount of lemon juice, and more salt. *I love this anchovy dressing, adapted from Food and Wine: Drain a 2-oz. can of oil-packed anchovies (or use 12 fillets from a larger jar) and combine in a blender with 1/3 c. freshly squeezed lemon juice and 1 tsp. minced rosemary. Blend until smooth. Drizzle in 1/2 c. olive oil with blender running, then season to taste with salt and pepper. You will have plenty of leftover dressing; grill more broccoli tomorrow or use the dressing up in a great version of a Salade Nicoise. This entry was posted in Food, Grilling, Recipes, Vegan or Would-Be-Just-As-Good-Vegan, Vegetables By Themselves and tagged broccoli, fall recipes, grilling, summer CSA recipes, summer recipes, we grill broccoli year-round, winter recipes on September 15, 2012 by emmycooks. Yum! Emmy, is summer ‘grilling season’ for you because of weather? Here at my little farm we grill year round, and I’d hate to think what I’d do if suddenly we couldn’t grill. It’s the only place where my husband knows how to cook! Oh, to have a Meyer Lemon tree! Yes, we mostly grill in summer–once it starts raining we braise instead. :) Do tell me if you grill cauliflower–I don’t think I ever have, but I usually love any veggies cooked on the grill. Grilled veggies are a nice suggestion. I think this would go really well with a bottle of Alvarinho (a Portuguese wine). This looks really good. I love broccoli, and I’ve roasted them on super high heat and it turns out like yours too with all the charred bits! So delish. I like roasting broccoli too, yum! On pizza with olives? Mmm. Love, love broccoli! I feel like you, there are so many yummy dishes I haven’t shared yet. Lol! We’ve roasted broccoli in the oven like cauliflower, and we’ve done broccolini and green beans on the grill. I might throw the broccoli I have in the fridge on the grill with the salmon tonight! Thanks for the inspiration! Do you get broccoli in your CSA? Our CSA broccoli is always amazing, and I love it on the grill. It’s like a different vegetable! I do get broccoli in my CSA quite frequently. Which I love because broccoli is one of my favorite veggies :) Looking forward to trying it this way. Oh, I am sure I would love this because I can never eat enough roasted broccoli and broccoli is one of my absolute favorite green vegetables! I hear you about summer ending – I am about to start mourning tomato season. We’re getting lucky this year with the long summer! If you like broccoli as much as I do, you might want to double the recipe–leftovers are great chopped and piled into a salad or on a pizza! Oh, love the anchovy dressing idea! I also am running out of summer…and the back to school, back to work thing has just gotten out of hand! Just to let you know, I made a riff on your zucchini fritters which came out great! Blogged it and you’ll find it on Hot, Cheap & Easy….with the proper credit given of course! We made this last night and it was fantastic. I’ve never grilled broccoli before, but rest assured we’ll be doing it again and again. Yum! It was easy too–we didn’t steam it. Thanks Emmy! I’ve never had a grill, but I used to do this thing I found in Vegan Brunch when I needed beautifully blackened broccoli… instead of grilling, or steaming, just sautee the broccoli over medium heat in 1-2 tablespoons of oil (letting it sit for about 2 minutes at a time to get a good char), for about 15 minutes. Amazingly, it tastes kinda like it’s seen real fire! The anchovy dressing is BRILLIANT. Must try this! That’s a great idea–I am rarely patient enough to let things brown well in a pan, but I will definitely try this on my griddle this winter after we put the grill away! I find I have to triple the amount of broccoli when I roast it due to shrinking and fingers that nibble before dinner. I haven’t grilled it before and love that idea. And I’m always a sucker for anything dressed with anchovies! How did I miss this when you posted it?! I am now VERY excited about the broccoli in the fridge. Fantastic. We enjoyed it VERY much.